is that the real tracklist of this japanese pressing ? Dire Straits swept into the 1980’s like a whirlwind of far too sweet cotton candy, giving everyone, as did the band Boston, a reason to dust off their air-guitar and play it to the high heavens. I’m not saying that the music wasn’t good, I am saying that it was entirely overplayed on FM radio at that time, was calculated and formulated to push all of listener’s buttons during those years, and like the sugar high it produced, after a number of years left this listener with nothing but a headache. A headache so bad, that even once Mark Knopfler and his terrycloth headband had left the group most listeners had washed their hands of anything that sounded remotely sonically close to that of Dire Straits. I’ve chosen this collection, as it simply defines who Dire Straits where, it’s an assemblage from beginning to end that mainlines the elements of Americana roots music with a very original and distinct guitar driven style, along with a vocal delivery that is deceptively appealing, almost matter of fact and entirely compelling. Again, as with the band Boston, Dire Straits was directly aiming at those who lived in white American suburbia. Knopfler’s songs revolve around everything that’s mundane, the silliness about issues that have been put to musical verse since time immemorial, the need for money, the need for finding a girl when one doesn’t look or move like Mick Jagger, those every-man problems, yet unlike the common man blue collar experiences Bruce Springsteen had been laying down, Dire Straits (who is actually Mark Knopfler) do it without the sincerity of soul. Yes, Dire Straits lace all of their material with outstanding hooks, and even when his stories attempt to produce the reality of truth, they simply fall short, as he’s no Bob Dylan, even with the snarl in his vocals, and he’s no Bruce Springsteen, as his material hides a bitterness that’s not readily present on the first couple of listens. That being said, Dire Straits picked the most formative years for both disco and punk to make their emergence, an aspect not lost on kids coming of age, kids who couldn’t relate to either of those concepts, sounding like nothing else that was being released during those confusing years. To that end, there are those who claim that Dire Straits got themselves pigeonholed, with that being the reason Knopfler eventually left the band. What Dire Straits did, was to subtly release the same album over and over again, meaning that every album was in effect simply another in a series of greatest hit guitar chords. The band was nearly unstoppable, where by the time Brothers In Arms was released in 1985, they were a headlong wave rushing at the coast, with an album featuring “Money For Nothing,” “Walk Of Life” and the haunting “Brothers In Arms,” where a mere year later, they would crash onto the shoreline and the rocks with On Every Street, a high water mark on the musical coastline; then as all waves do, backed off into nothingness, a ten year run that left them nearly forgotten to the wind. The question here is, “What happened?” How could a band this big be abandoned, have been in nearly everyone’s music collection and be so forgotten? 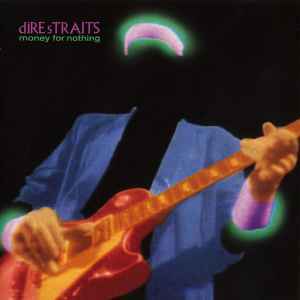 Bruce Springsteen, Bob Dylan, Tom Petty, their music still resonates today, yet Dire Straits were a flash in the pan, one that certainly made them a ton of money, yet has left them to fall between the cracks, to be forgotten to the ages. Knopfler and his band of guitar gunslingers were a breath of clean fresh air, filled with dizzying guitar emancipations, Knopfler was a virtuoso at crafting mini dramas with lyrical and guitar flourishes, material that was consuming, polished beyond brightness, so was well crafted that Dire Straits became transparent, an embodiment ‘of’ the times and not of the music, a band who rose and died with MTV, nearly boring, as fans finally came to terms with the fact that there was not a single kernel of truth found within these grooves, where nearly over night millions of copies of Dire Straits albums found their way into second hand music stores, where with so many for sale, they sold for but a dollar or two a piece. Dire Straits were mainstream from the time they first stepped foot in the studio, it’s just that that mainstream-ness took awhile to assimilate. So, if you’re looking back, wondering what all the hoopla was about, or if you find your collection lacking a single album from Dire Straits, may I suggest that you find your way to the collection of Money For Nothing, a staggering collection of that cotton candy guitar sweetness that defined Dire Straits … where in the end, with it’s consistent sting of hits, is the only album you’ll ever need. Post Script: One would think that will all of Dire Straits platinum hits, that their compilations albums would be rather highly rated, when in fact, these are pretty much middle of the road also. I’m rating this album highly, not because I play it, or consider it to be that good well into the 21st Century, but because at the time, I did manage to play it quite often. Nikki Sixx of Motley Crue claimed that the song “Money For Nothing” was about Motley Crue’s outrageous lifestyle, saying that members of Dire Straits were in a store that sold televisions, and every TV was playing Motley Crue videos. See the sub-notes. Version with fake privately made cover was merged with the genuine copy. The fake cover doesn't turn official no matter how many times you claim it's official or a promo. Why is this release blocked from sale in the market place, it is not a bootleg is it? Great compilation LP. Essential 1988 CD with great, audiophile-grade dynamics. Unofficial home-made cover. Not a genuine promo cover. Created and printed in 2017 by a person in Mexico. It is a fake cover. The Dire Straits are one of my all time favorite band. Mark Knopfler's style is unique. His timing, it's like talking while singing, or singing while talking and he really tells you a story. Strong lyrics, great music. And yes, he isn't the greatest singer in the world and he hasn't got the best band availible behind him, but it just fits with the sound of a screaming stratocaster and the way the music is made. Exactly the reason why it works so great. This album is a great compiliation of their work (1978-1988 at least). Almost all the songs you want is on this album. Almost all, because if I could I would replace 'Where you think you're going' for 'Telegraph Road'. But that wouldn't fit on a LP I guess. So lets leave this album the way it is. Near perfect. But still, if you like them, you should get all their albums and see this as an amazing summary. Money For Nothing by ASR_corp. Sultans of Swing by ASR_corp. Records I got in 2013 by EllieF.